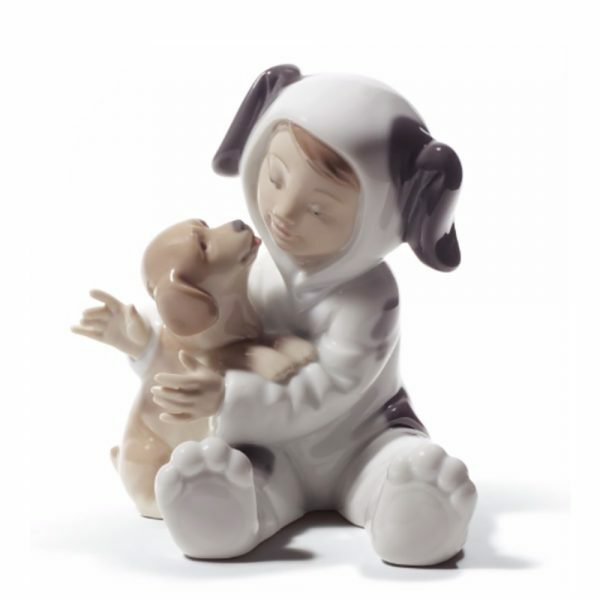 LLADRO MY PLAYFUL PUPPY figurine with gift box. Sculptor: José Javier Malavia, Release year 2011. A glazed porcelain figure of a cute little boy in a brown and white dog suit playing with his lovely golden puppy dog. The artist has captured, through the delicate facial expressions and pose, the joy the two figures share in staying together. Compra adesso il prodotto ed ottieni 180 Crediti! Buy now and earn 180 Points!